6.75 oz. Jersey Knit, 100% Cotton Provides a relaxed and classic style to fit any work environment. Soft and durable 100% polyester that wicks away moisture and dries quickly. The 100% polyester blend is soft to the touch, so you won’t be plagued with any skin irritation after wearing it all day at work. Are you looking for a light, durable shirt that will keep you cool on the job in the summer heat? Do you need clothing that will be compatible with your job in a physically strenuous environment? If you need a tremendously comfortable tee shirt that also features reliable quality, we have the perfect product for you right here at Contractor’s Solutions. These high visibility shirts are long sleeved to protect you from the elements. They also come with a breast pocket, so that you can carry what you need to do your job. These yellow-green fluorescent hi vis shirts are ANSI/ISEA 107 Class 3 Compliant. Hi-vis t-shirt with 50-mm-wide reflective tape. This is no ordinary t-shirt. Complete with anti-odor treatment, UV protection 40+ and ANSI/ISEA 107-2015 Type R, Class 2, this t-shirt keeps the sun off and the smell out. Short sleeve pocket tee shirts from Dickies, made of 100% cotton and with a single pocket on the chest for your convenience. Heavyweight short sleeve pocket tee shirts from Dickies, featuring comfort and great fit made from 100% cotton and a sturdy 6.75 oz. Jersey knit. Performance short sleeve cooling tee shirts from Dickies, crafted with Advanced Cooling Technology built right in—along with UV protection. Performance short sleeve Drirelease® tee shirts from Dickies, a great product made of a polyester/cotton blend that wicks moisture away to keep you cool and dry. Base Performance Tee Shirts from BlakLader, featuring 100% polyester instead of cotton, which helps keep you cool on those hot jobs. 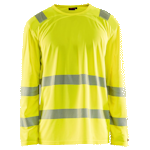 Class 2 and Class 3 high visibility tee shirts from Tingley, which offer not only fluorescent colors and reflective tape but also a breast pocket. High visibility pocket tee shirts from Berne, a great offering that combines bright fluorescent color with reflective tape and a tagless collar design. Pocket tee shirts from Berne, straightforward and simple—the classic 100% cotton tee shirt with a chest pocket.